1. Properties of Addition and Multiplication . 5. Working with Negative Numbers . 6. Numbers - True or False . 7. Prime and Composite Facts for Numbers 1 through 20 . 8. Prime and Composite Numbers . 9. Numbers - Prime, Composite, Odd, Even, Multiple, Factors . 10. Factors and Multiples . 11. Multiples of Numbers up to 20 . 12. Factors of Numbers upto 100 . 14. Prime Factorization of numbers upto 500 . 15. Prime Factorization Word Problems . 16. Order of Operations . 18. Compare and Order Numbers . 21. Numeration and Notation . 22. Mean, Median, and Mode . 24. Numbers in Words - Up to Billions . 25. Words to Numbers Up to Billions . 26. Place Value - Numbers through Billions . 27. Short Word Form . 28. Multiplication & Division as Opposite Operations . 29. Rounding to Nearest 100,000 . 30. Rounding to Nearest Million . 31. Multiplying Large Factors . 32. Multiplying Several Single Digit Numbers . 2. Decimal Place Value upto Ten-Thousandths . 3. Place Value with Decimals to Hundred Thousandths . 4. Expanded Form - Decimals . 4. Expanded Form - Decimals - 2 . 5. Expanded Form - Decimal Number . 9. Decimals to Fractions . 10. Decimals on a Number Line . 11. Estimating Decimal Products . 13. Decimal Sums - 2 . 13. Decimal Sums - 3 . 13. Decimal Sums - 4 . 13. Decimal Sums - 5 . 14. Decimal Differences - 2 . 14. Decimal Differences - 3 . 14. Decimal Differences - 4 . 14. Decimal Differences - 5 . 15. Decimal Products - 2 . 15. Decimal Products - 3 . 15. Decimal Products - 4 . 15. Decimal Products - 5 . 16. Multiplying Decimals by 10 . 17. Multiplying Decimals by 100 . 18. Multiplying Decimals by 1000 . 1. Divisor, Dividend, Quotient and Remainder . 3. Division (Find n) . 4. Rules for Divisibility - Table . 5. Rules for Divisibility . 7. Division with One Digit Divisor . 8. Division of Large Numbers - One Digit Divisor . 8. Division of Large Numbers - One Digit Divisor - 2 . 8. Division of Large Numbers - One Digit Divisor - 3 . 8. Division of Large Numbers - One Digit Divisor - 4 . 8. Division of Large Numbers - One Digit Divisor - 5 . 9. Division of Large Numbers - Two Digit Divisor . 9. Division of Large Numbers - Two Digit Divisor - 2 . 9. Division of Large Numbers - Two Digit Divisor - 3 . 9. Division of Large Numbers - Two Digit Divisor - 4 . 9. Division of Large Numbers - Two Digit Divisor - 5 . 10. Division of Large Numbers - Three Digit Divisor . 10. Division of Large Numbers - Three Digit Divisor - 2 . 10. Division of Large Numbers - Three Digit Divisor - 3 . 10. Division of Large Numbers - Three Digit Divisor - 4 . 10. Division of Large Numbers - Three Digit Divisor - 5 . 11. Dividing Very Large Numbers with Remainders . 11. Dividing Very Large Numbers with Remainders - 2 . 11. Dividing Very Large Numbers with Remainders - 3 . 11. Dividing Very Large Numbers with Remainders - 4 . 11. Dividing Very Large Numbers with Remainders - 5 . 12. Division with Remainder - Three Digit Divisors . 12. Division with Remainder - Three Digit Divisors - 2 . 12. Division with Remainder - Three Digit Divisors - 3 . 12. Division with Remainder - Three Digit Divisors - 4 . 12. Division with Remainder - Three Digit Divisors - 5 . 1. Dividing Decimals by Whole Numbers . 2. Decimal Division - 2 . 2. Decimal Division - 3 . 2. Decimal Division - 4 . 2. Decimal Division - 5 . 3. Writing Zeroes in the Dividend . 4. Dividing Whole Numbers without Remainders . 5. Dividing Decimals by 10 . 6. Dividing Decimals by 100 . 7. Dividing Decimals by 1000 . 8. Rounding Decimal Quotients . 9. Checking Divisions Which are not Exact . 10. Decimal Division Word Problems . 2. Fractions from 1/2 to 1/12 . 3. Greatest Common Factors - GCF . 6. Ascending and Decending Order . 7. Least Common Multiple - LCM . 8. Prime Factorization and LCM . 9. Least Common Denominator - LCD . 11. Comparing Fractions on a Number Line . 12. Adding/Subtracting Fractions With Like Denominators . 13. Adding/Subtract Fractions with Unlike Denominators . 14. Multiplication and Division of Fractions . 15. Multiplying Fractions and Whole Numbers . 16. Mixed Number to Improper Fraction . 17. Improper Fractions to Mixed Numbers . 18. Rounding Mixed Number to Nearest Whole Number . 19. Adding/Subtracting Mixed Numbers . 20. Adding/Subtracting Mixed Fractions with Unlike Denominators . 23. Fractions to Decimals . 24. Decimal to Fraction . 25. Fractions and Decimals . 27. Fractions and Decimals Word Problems . 1. Measurement Facts Table . 2. Measurement Facts (Metric System) . 3. Measurement Facts (U.S. Customary System) . 4. Unit of Length (Metric System) . 5. Unit of Mass/Weight (Metric System) . 6. Unit of Capacity (Metric System) . 7. Units of Time . 8. Changing Units in the Metric System . 9. US Customary Units Abbreviations . 10. Units of Length (US Customary System) . 11. Units of Mass/Weight (US Customary System) . 12. Units of Capcity (US Customary System) . 13. Measuring Length to Sixteenth of an Inch . 14. Convert Units of Length - Metric & US Customary System . 15. Convert Units of Weight - Metric & US Customary Systems . 16. Convert Units of Capacity - Metric and US Customary Systems . 18. Adding and Subtracting with Different Units . 19. Multiplying and Dividing with Time . 2. Measuring Kinds of Angles . 3. Kinds of Triangles . 4. Recognizing the Type of a Triangle . 4. Recognizing the Type of a Triangle - 2 . 6. Kinds of Quadrilaterals . 6. Kinds of Quadrilaterals - 2 . 9. Naming the Polygons . 14. Diagonals of Polygons . 15. Finding the Areas of Shapes . 18. Circle Facts - 2 . 2. Areas of Figures . 3. Perimeters of Figures . 4. Perimeter, Area and Volume Facts . 6. Finding Area/Perimeter of Squares and Rectangles . 7. Finding the Area/Perimeter of Triangles . 8. Finding the Area/Perimeter of Parallelogram . 9. Area and Perimeter Formulas . 10. Finding the Areas of Shapes . 2. Ratio Word Problems . 4. Fractions, Decimals, and Percents Table . 6. Percents to Decimals . 7. Percents to Fractions . 8. Fractions to Percents . 9. Decimals to Percents . 10. Finding Percentage of a Number . 11. Percentage Word Problems . 13. Average - Word Problems . 14. Mean Median Mode . 16. Reading and Writing Graphs . 16. Reading and Writing Graphs - 2 . 17. Circle Graphs - 2 . 1. Rectangular Prisms and Cubes . 2. Solids Shapes (Prisms) . 4. Geometry - Polyhedrons . 1. Volumes of Figures . 2. Formula for Volume of a Rectangular Prism . 3. Volume and Surface Area . 4. Changing U.S Customary Units of Volume . 5. Changing Metric Units of Volume . 6. Volume Of Prisms . 1. Rates and Speed . 1. Functions and Equations . 2. Solving for X . 3. Functions and Graphs . 4. Algebra (Find the Unknown) . 1. 5th Grade Math Review . 1. 5th Grade Math Review - 2 . 1. 5th Grade Math Review - 3 . 1. 5th Grade Math Review - 4 . 1. 5th Grade Math Review - 5 . 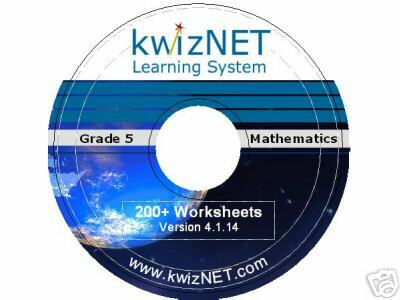 For unlimited printable worksheets & more, go to http://www.kwiznet.com/.